As sea ice in the Arctic continues to shrink during this century, more than two thirds of the area with sufficient snow cover for ringed seals to reproduce also will disappear, challenging their survival, scientists report in a new study. The ringed seal, currently under consideration for threatened species listing, builds caves to rear its young in snow drifts on sea ice. Snow depths must be on average at least 20 centimeters, or 8 inches, to enable drifts deep enough to support the caves. "It's an absolute condition they need," said Cecilia Bitz, an associate professor of atmospheric sciences at the University of Washington. She's a co-author of the study, published in the journal Geophysical Research Letters. But without sea ice, the platform that allows the snow to pile up disappears, ultimately reducing the area where the seals can raise their pups. Bitz typically focuses on studying the area and thickness of sea ice. "But when a seal biologist telephoned and asked what our climate models predict for snow depth on the ice, I said, 'I have no idea,'" she said. "We had never looked." 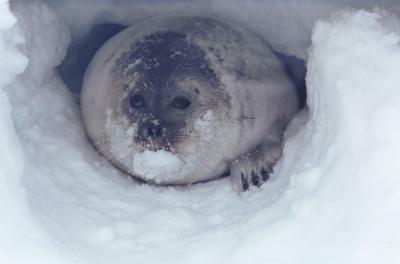 That biologist was co-author Brendan Kelly of the National Science Foundation and he was curious about the snow depth trend because he was contributing to a governmental report in response to the petition to list the seals as threatened. The researchers, including lead author and UW atmospheric sciences graduate student Paul Hezel, found that snowfall patterns will change during this century but the most important factor in determining snow depth on the ice will be the disappearance of the sea ice. "The snowfall rate increases slightly in the middle of winter by the end of the century," Hezel said. However, at the same time sea ice is expected to start forming later in the year than it does now. The slightly heavier snowfall in the winter won't compensate for the fact that in the fall -- which is also when it snows the heaviest -- snow will drop into the ocean instead of piling up on the ice. The researchers anticipate that the area of the Arctic that accumulates at least 20 centimeters of snow will decrease by almost 70 percent this century. With insufficient snow depth, caves won't hold up. Other climate changes threaten those caves, too. For instance, the snow will melt earlier in the year than it does now, so it's possible the caves won't last until the young seals are old enough to venture out on their own. In addition, more precipitation will fall as rain, which soaks into the snow and can cause caves to collapse. The research is important for more than just the ringed seals. "There are many other reasons to study snow cover," Hezel said. "It has a huge thermodynamic impact on the thickness of the ice." Snow on sea ice in fall and winter acts like a blanket that slows the release of heat from the relatively warm ocean into the atmosphere. That means deeper snow tempers sea ice growth. In the spring, snow has a different impact on the ice. Since snow is more reflective than ice, it creates a cooling effect on the surface. "So the presence of snow helps sustain the icepack into spring time," Hezel said. To produce the study, the scientists examined 10 different climate models, looking at historic and future changes of things like sea ice area, precipitation, snowfall and snow depth on sea ice. 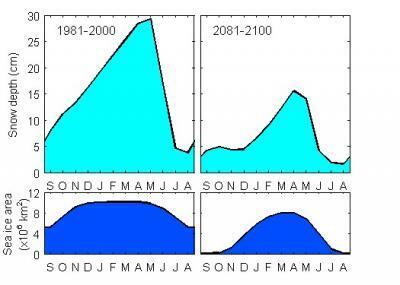 The resulting prediction for declining snow depth on sea ice this century agreed across all of the models. The new research comes too late to be cited in the report about ringed seals that was written by the National Oceanic and Atmospheric Administration in response to the petition to list the ringed seal as threatened. However, it confirms results that were based on a single model that Bitz provided for the report two years ago. NOAA expects to issue its final decision soon. The UW scientists on this study were funded by the Office of Naval Research.